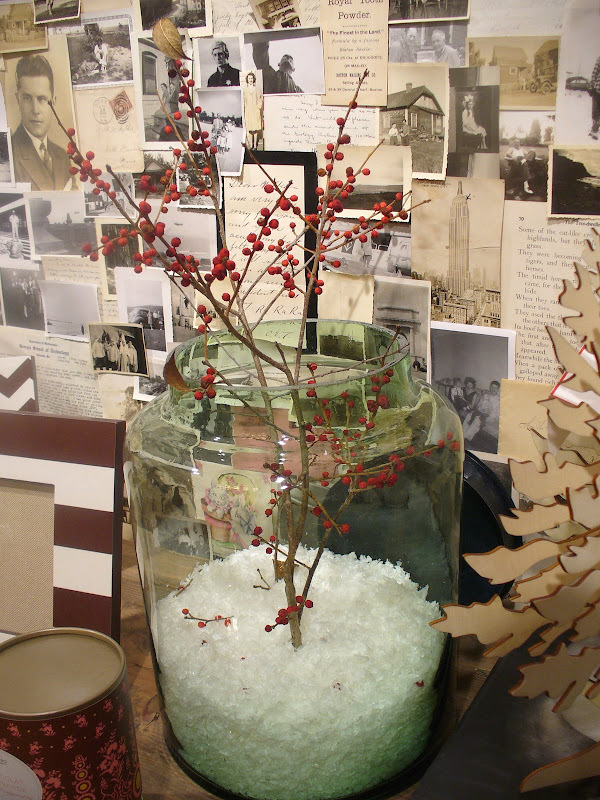 Hudson in Boston has a very intriguing collage wall in the back of their store. 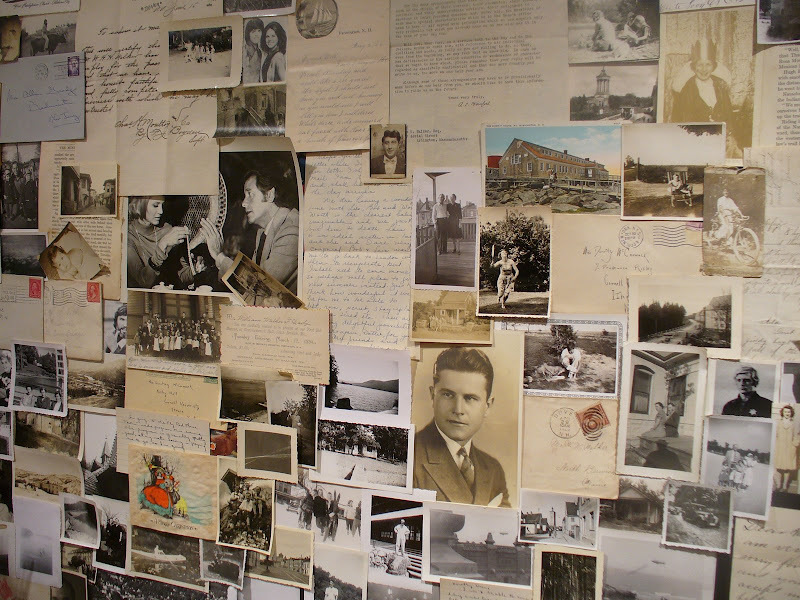 Full of vintage photos, letters, addressed envelopes and other bits and pieces it is a real attention getter. I found myself lingering there for quite a while taking it all in. 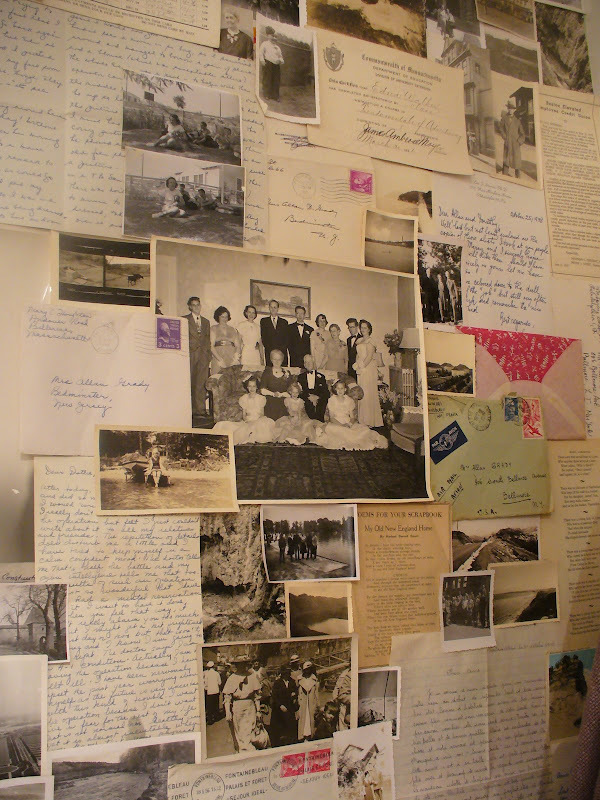 Years ago I visited a house where the entire wall of their basement stairwell was a collage of their family - past and present. A typically boring transition space was transformed into a meaningful and interesting design space. Do you notice a famous brother and sister in this section below? Love the handwriting in the letter above - what a John Hancock. So pretty! It seems so much more special to keep things like this out on display rather than storing them away in organized boxes, like I usually do... Hmmm change may be in the air! Thanks for sharing this idea wal1! What a great idea. I have a blank wall so thanks for the inspiring photos. I love wall collages and this is a fabulous one - I find they happen unintentionally near near my desk, xv. I have a huge (4x5) bulletin board framed with an old gesso frame, above my desk. It's gradually becoming like this wall. Black and white and sepia with a few touches of red stamps: Just Perfect! I love this idea. So interesting. I spotted Donny and Marie right away. Hudson is a great store, isn't it?! 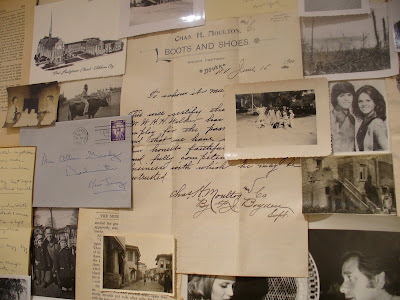 And, I do love the collage wall - although I'd never have the patience! I love Hudson, this is beautiful. thank you. That is a FUN wall... I can see why you would linger over it! People are forever selling vintage photos at the flea markets... sad that they are lost to the public... yet GREAT that others appreciate them! I've seen something similar in a local coffee shop, but I've never thought of doing it at home. I think I'm a bit too fond of framing. But it's a really nice idea to use old letters. Hmmm now you got me thinking! Thank you for an inspiring post! Oh, that is exquisite! I love vintage photos and ephemera and never quite know how to display it without it looking like a cluttered mess. Now that I have a home office, I am hungry for some photo displays that don't seem to work in other parts of the house. Yes, that is beautiful handwriting - that in itself is a gift, isn't it?! Beautiful! I think every time you walked by you would see something new in the collage! There's just so much to look at! Thanks for sharing the idea! Having vintage shots are great...i have a couple of my family but id feel a bit odd placing some of people i didnt know...hmmm I think i'd always wonder who that person was ha! wow just tuning in and I love this wall of images - just the best use of old images I've seen in ages - my heart jumped when I saw it! An excellent idea. What a wonderful use of space and inspirational pieces. I love this idea. I also love that it is from Hudson. I posted about the store a couple of days ago when I feel in love with their site. This is just another reason to make a trip to Boston and check it out in person.